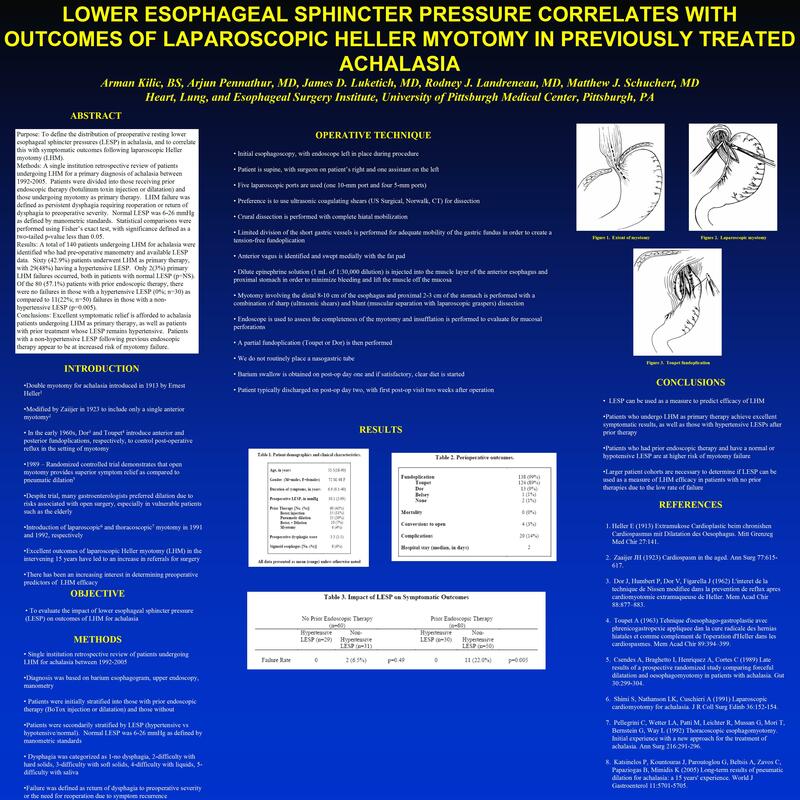 Background: The purpose of this study was to define the distribution of preoperative resting lower esophageal sphincter pressures (LESP) in achalasia, and to correlate this with symptomatic outcomes following laparoscopic Heller myotomy (LHM). Methods: A single institution retrospective review of patients undergoing LHM for a primary diagnosis of achalasia between 1992-2005. Patients were divided into those receiving prior endoscopic therapy (botulinum toxin injection or dilatation) and those undergoing myotomy as primary therapy. LHM failure was defined as persistent dysphagia requiring reoperation or return of dysphagia to preoperative severity. Normal LESP was 6-26 mmHg as defined by manometric standards. Statistical comparisons were performed using Fisher’s exact test, with significance defined as a two-tailed p-value less than 0.05. Results: A total of 140 patients undergoing LHM for achalasia were identified who had pre-operative manometry and available LESP data. Sixty (42.9%) patients underwent LHM as primary therapy, with 29(48%) having a hypertensive LESP. Only 2(3%) primary LHM failures occurred, both in patients with normal LESP (p=NS). Of the 80 (57.1%) patients with prior endoscopic therapy, there were no failures in those with a hypertensive LESP (0%; n=30) as compared to 11(22%; n=50) failures in those with a non-hypertensive LESP (p=0.005). Conclusions: Excellent symptomatic relief is afforded to achalasia patients undergoing LHM as primary therapy, as well as patients with prior treatment whose LESP remains hypertensive. Patients with a non-hypertensive LESP following previous endoscopic therapy appear to be at increased risk of myotomy failure.